Don't we all love snacking? And this seems to be one of those things we are not really ''allowed'' to do, especially if we want loose weight, right?! Well, guess what? One of my favorite things to do when I am reading, watching TV or working in the office is snacking. And that's what I really do... and I still managed to loose the extra weight and I still manage to keep it. All you need to know is how to snack wisely, healthy and deliciously... That's the only catch. You never have to give it up... You just need to do some slight changes in your snacking habits. That's all. One of my favorite snacks is by far Raw Kale Chips. I am sure you all heard of kale benefits and how good it is for us. Many of us still feel ''threatened'' by green leafy vegetables, either due to the taste or due to lack of knowledge and awareness that green leafy veggies actually could be very tasty and delicious. All you need to know are a few tricks and recipes, of course. Another good thing about this recipe that it is easy to make and pretty fast too. Healthy fast food. All you need are a few ingredients but you would need some patience in order to dehydrate it and get the crispy touch to it. Cut your kale into small pieces which will be your chips once dehydrated. Wash it well and let it dry on a dry cloth until you make the sauce. Blend the ingredients, cashews, red bell pepper, salt, nutritional yeast, chili flakes, and then add some water in order to blend better. Once it all blends well and the consistency is nice and smooth, pour it over kale. You will want kale to absorb well the sauce, so you can use your hands to massage it well into the leaves. 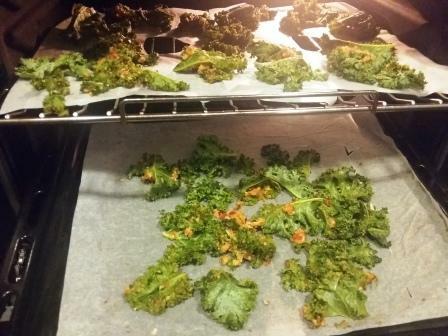 Once your kale leaves are well marinated, let them sit for 15-20 minutes and then layer it nicely into your dehydrator. If you don't have a dehydrator, you can also use your oven. Heat it up but to less than 50 degrees Celsius, and let it dehydrate. In my case, my dehydrator seems to be overheating, so sometimes when I am impatient I use it, but if I have time and patience, I use my oven. It takes 12-14 hours to dehydrate them well. Don't forget to turn the wheel of your oven to air circulation. And, voila... Your chips is ready!